If you want to take your rhythm guitar playing to the next level this series will help. The topics and skills covered here apply equally to playing both rhythm and electric guitar. Welcome to the Rhythm Guitar Quick-Start Series. These lessons are ideal for guitarists that want establish a solid foundation for playing rhythm guitar. The ideas and concepts covered here are essential for guitarists interested in playing popular songs, jamming with friends, or even performing live music. It doesn’t matter if you play acoustic guitar or electric guitar – the lessons apply equally to both. If you are brand new to playing the guitar it’s recommended that you go through the Beginner Guitar Quick-Start Series before jumping into these videos. Those beginner guitar lessons cover some important basics that will prepare you for the information covered in this rhythm series. If you are ready to learn how to play rhythm guitar go ahead and start with the first lesson. As with all of our quick-start series it’s recommended that you go through the lessons in the order they are presented. You’ll learn how to play power chords, how to use power chords, how to play bar chords, major bar chord shapes, minor bar chord shapes, common chord progressions, how to play open chords, essential strumming patterns, how to develop timing and feel, and dynamic strumming tips. You may be tempted to skip this series either because you feel comfortable with a few chords or because you are excited to learn lead guitar. We strongly recommend you take the time to work through these rhythm lessons for three important reasons. First, the information covered in these lessons will help you achieve greater freedom around the fretboard. Second, the majority of what guitarists play on the guitar is rhythm based, so it’s extremely valuable to further develop this skill. Third, the information covered here serves as important building blocks for many concepts in both lead guitar and blues guitar. Are you interested in fast-tracking your progress with more lessons, jam-tracks, and learning tools? Check out Guitareo.com. 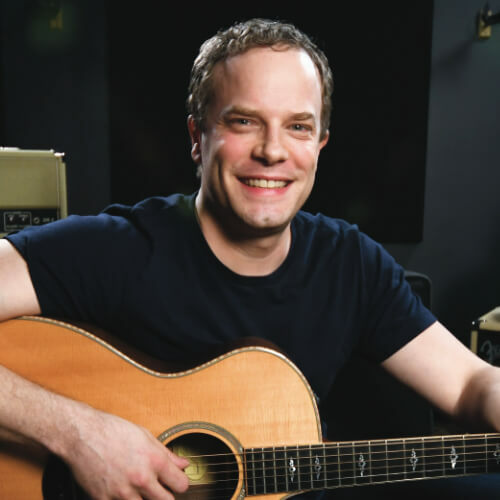 It’s Nate Savage’s comprehensive video training system that covers all the popular musical styles, including: rock, blues, country, fingerstyle, metal, classical, bluegrass, jazz, and more.